A big part of our excitement for the 2017 remake of Beauty and the Beast comes from being able to see characters we grew up with come to life. For most people (myself included), Belle is their favorite Disney Princess—so you can imagine the expectations everyone has! One thing we definitely loved about the character? Her outfits. We thought Emma Watson's costumes stayed true enough to the original film, while delivering a few tweaks here and there to suit our feisty lead and her millennial audience. 1. Belle's everyday dress had to be functional and practical, since she moves around a lot. Costume designer Jacqueline Durran told PEOPLE that they added bloomers under Belle's blue pinafore, and it became Emma Watson's favorite element of the outfit. "They were part of her being able to be more active, so that you don't feel restricted by wearing a skirt because you can just pull it up and then just do whatever you were going to do," Jacqueline explained. 2. Certain details are rooted in history, though Jacqueline interpreted them to suit our heroine. For instance, the pockets in Belle's pinafore actually existed in peasants' clothing from the 18th century. "It's just that people didn't wear them outside like she does. They wore them inside the dress, hidden. But we just put them on the outside [like a tool belt] to look extra useful. So I would take elements that were historical and bring them with a twist into our Disney Beauty and the Beast world," she told Fashionista. 3. The red outfit Belle wears during "Something There" is eco-friendly! Emma champions sustainability and fair trade in fashion, which motivated Jacqueline when designing this particular look. She shared with PEOPLE, "That [red] costume was made entirely from sustainable fabrics. We dyed it in vegetable dyes in our workroom, we had shoes made with eco leather, and we did the whole thing from top to bottom to be as thorough as we could." 4. 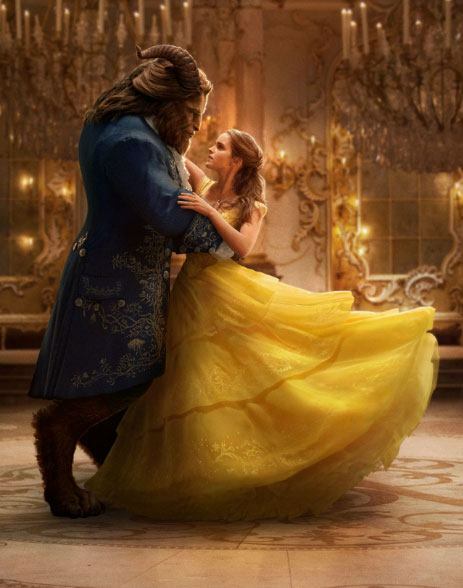 A lot of time, effort, and materials went into the creation of Belle's signature gown. According to E! News, the dress is made with 3,000 feet of thread and 180 feet of satin organza, and is decorated with 2,160 Swarovski crystals. Lastly, it took the team 12,000 hours to produce. WOW! 5. Getting that exact shade of yellow also proved tough. "It was really a process. We did lots of camera tests on different colors of yellow. [We looked at] how much shine the yellow had; how matte the yellow was; whether the fabric had the texture; what tone the yellow was. How was it in the light or the darkness of the ballroom when it goes through all the scenes? Sometimes, what you thought was the right yellow would be completely wrong once you camera tested it. We [also] wanted the yellow that suited Emma and was close to the original yellow because that seemed to be an important link," Jacqueline pointed out to Fashionista.